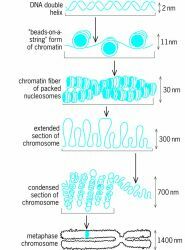 Temporal profile of replication of human chromosomes. Studies conducted in the past have suggested that a particular tumour-suppressing gene on human chromosome 22, known as NF2, may be a possible contributor to meningioma. What kind of news is it to say chromosome 22 is the first human chromosome to almost be fully sequenced? The 16 million bases of the long arm of chromosome 2, however, make up one of the longest continuous segments of DNA ever sequenced--second only to a piece of human chromosome 22 unveiled earlier this month. 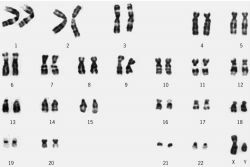 Yet mice with an extra copy of a segment of chromosome 16, their equivalent of human chromosome 21, don't develop amyloid deposits despite having an extra APP-gene copy, notes Zygmunt Galdzicki of the Uniformed Services University of the Health Sciences in Bethesda, Md. To-date, Hematech has demonstrated that the human chromosome fragment was retained in the cloned cattle and the human antibody genes carried on the chromosome fragment underwent normal processing. Just the other day, we discovered that scientists have developed computer mice that have an abnormal human chromosome "in every cell of their bodies". Sick Twisted Secret Genetic Experiments - Human-Animal Hybrids Are Right here! com)-- An integrated quantitative genome data analysis was recently able to pinpoint 18 genes on human chromosome 20q that could potentially serve as novel molecular targets for cancer therapy.